Beijing has preempted the territory’s courts by interpreting the Basic Law to prevent two independence activists from taking office. Markets are shrugging as black-clad youths protest, but long-termists in the financial sector should be more rattled about Hong Kong’s future. China's parliament passed an interpretation of Hong Kong's Basic Law on Nov. 7 that says lawmakers must swear allegiance to the city as part of China, Beijing's most direct intervention in the territory's legal and political system since the 1997 handover. The decision came in advance of a ruling by Hong Kong courts on the matter. The interpretation added details to Article 104 of the Basic Law, the city's mini-constitution, which already requires those assuming office to swear allegiance "to the Hong Kong Special Administrative Region of the People's Republic of China." The new interpretation, which is not considered an amendment, says that "an oath taker who intentionally reads out words which do not accord with the wording of the oath prescribed by law, or takes the oath in a manner which is not sincere or not solemn, shall be treated as declining to take the oath," adding that there is to be no means for retaking the oath if invalid. Yau Wai-ching, 25, and Baggio Leung, 30, pledged allegiance to the "Hong Kong nation" and displayed a "Hong Kong is not China" banner during a swearing-in ceremony for the city's legislative council in October. They were not sworn in and the city's chief executive filed a lawsuit seeking an injunction against them getting another chance. 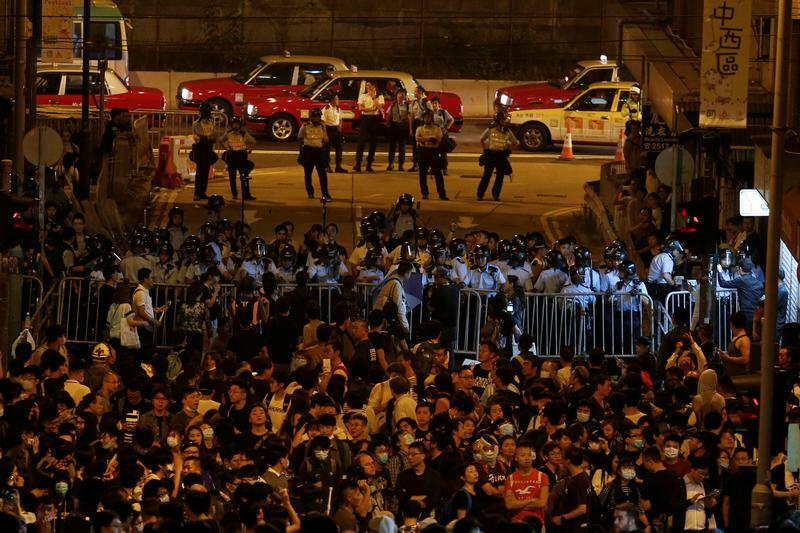 Police fired pepper spray in running battles with thousands of demonstrators on the streets of Hong Kong on Nov. 6 as they protested Beijing's attempts to stop independence activism.